Many of us have heard the song lyric “Everything old is new again” and so it goes in the world of travel and the discovery of ‘new’ destinations. They’ve been there all the time but due to political change, end of conflict, new attractions, reconciling the need to maintain local culture and traditions with the welcoming of foreign visitors, along with the dollar and cents (sense) need to bring in foreign capital, old silent global neighbours are now the new kid on the block when it comes to travel. We know from our psychographic studies that in 2012-2013 people are planning trips that are easy on their soul and quell their inner needs that might include: adventure, cruising, sun and sand, quiet meditation, exploration and discovery, challenge or simple, pure escapism. But we know that travellers who may have shown brand or destination loyalty in the past, are now labeled as ‘pro-actively fickle’, meaning that each travel experience carries with it the excitement of doing something different, visiting a new destination, trying out different modes of accommodation and sometimes even dabbling in new lifestyles, be they luxury or bohemian or becoming one with the locals. Travelling alone in Japan in 2004, the only hotel in a small town had one room left—Japanese style. Never having experienced it, I took the room, slept on the floor on tatami mats, sat cross-legged at a knee-high table to drink my tea, and soaked in the shoulder-deep standing bathtub. Since that time, I always ask for the Japanese style rooms because it feels like the natural thing to do when in Japan and for me a feel-good experience. Travel today is a mixture of thinking outside the box, forcing oneself to act outside of one’s comfort level and gathering the world closer. Myanmar is a great example of a country that changed its political tone in 2012 and immediately started to concentrate on a tourism infrastructure. It is now slated as one of the ‘must-see’ destinations for 2013. Of course this is a double-edged sword, as in many ‘new destinations’ who want to show off their cultural treasures. When I visited the country in 1993, I ran into perhaps a dozen other tourists but the Burmese people were genuinely curious about us, the temples were untouched except by those paying homage to Buddha, and the food was local fare, made for Myanmar appetites and not for tourists. One can only wonder how the country will evolve once tourism takes hold. The ‘good’ is that travellers will see the marvels of the country and have the opportunity to interact with the people; the ‘challenge’ is that some aspects of their history and culture will be sacrificed. But that’s the way of the world these days. And a quick jaunt around the globe reveals other destinations trending toward popularity with travellers who have only now discovered, or have the means, or wish to challenge their exploration-curiosity or endurance. Southern India, Sri Lanka, Nepal and Bhutan are enjoying a revitalized scrutiny by travellers. Bhutan is perhaps at the top of this ranking due to a secretive and mysterious past where outsiders were shunned and the cost of travel to and into the country was only available to upscale incomes and appealed to those who were up for the physical challenges of visiting the monasteries, villages. temples and markets. Today it is a featured destination for Virtuoso members and the Kingdom is looking to show off their leitmotif of happiness and bliss as an example to the world. Sri Lanka was named by Lonely Planet as the top destination for 2013 due to the ancient temples and monuments, the beaches, tea plantations, food, adventure and resort activities and, of course, the people and culture. Having visited twice, I concur. Cox and King’s bring attention to the Maha Kumbh Mela Festival which takes place every six years and therefore 2013 will be the site of a guesstimated 70 million people pilgrimage, over 45 days, to the Ganges River in Allahabad in Uttar Pradesh. Certainly as one of the world’s most spectacular religious gatherings, both pilgrims and tourists will attend. Columbia has resurrected its reputation from being a ‘must-avoid-drug-cartel’ destination to one that excels in adventure, attractive cities, towns, beaches, parks and cuisine. But in South America, the other ‘new’ destinations include a re-discovery of Argentina, with its architecture, delicious Malbec wines, mountains, cuisine, markets and museums. Brazil is in the throes of pulling off a destination hat trick with the Confederations Cup in 2013, the FIFA World Cup in 2014 and the Summer Olympics in 2016. As with many countries where the main airport cities are the most recognizable, Brazil is tempting visitors with visits to smaller towns where adventure and cultural interaction are the star attractions. Uruguay is following suit with pre-colonial towns, astounding beaches, savoury cuisine and the chance to experience (as you can also do in Argentina) the gaucho-cowboy lifestyle. And Ecuador, the home of the Galapagos Islands, is listed in the Lonely Planet’s Top Ten for 2013, boasting the steepest stretch of railway in the world as it connects the Cotopaxi Volcano with the Nariz del Diablo, the Devil’s Nose. In Central America the countries that experienced terrible civil conflicts over 25 years ago are now promoting their tourism bounties. For 2013, both El Salvador and Nicaragua are considered the ‘hot’ attractions, each with an incredible array of adventure, culture and culinary activities. In Africa, Botswana is marketing ‘the last wilderness on earth’ in the Okavango Delta, and Madagascar, long the secret treasure of adventure tour companies, is being given a new tourism identity. Lonely Planet, which seems to want to preserve the delicate eco-system, notes in their top ten list: “For visitors, the time to go is now, before the country reappears in travel agents’ windows. Be prepared to be overwhelmed: in both fauna and landscapes, the world’s fourth-biggest island is otherworldly. 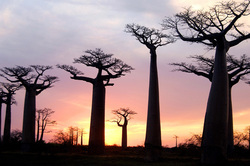 To those seeking a place out of the ordinary, Madagascar cannot fail to delight”. One can only hope that Lonely Planet’s whispered note that “pssssst—you should go now” will not be the beginning of the end of that eco-system”. To paraphrase the spirit of the words of the Dalai Lama, it is important for tourists to see as much of the world as possible with their own eyes in order to make their own decisions and not embrace rumours or boycotts or false-principled decisions about a country’s past. Nothing beats firsthand experience and the new/old countries will certainly serve to open travellers’ eyes. Of course the bottom line in an economically challenged world is the contribution that tourism makes to the GDP. And one can only hope that the new/old countries don’t surrender too much of their culture, their delicate eco-systems and their history to the lust for tourist dollars. Travellers need to be educated about the etiquette of travel and their responsibility as global visitors. Turning the adventure mantra on its head (Take nothing but photographs/Leave nothing but footprints), the new version must be to take nothing and leave nothing but respect for the country and its people. It is ironic that in 2012-2013 travellers are tiring of the ‘usual suspects’—those countries that already enjoy a booming tourism industry, and are instead looking to countries that have been beckoning for tourists to visit for many years. Only now are these destinations coming into vogue. Everything old is new again, yes, but it’s a brave new world of tourism that keeps reinventing itself. We can only hope that in twenty years’ time, we will still be able to enjoy the bounties of pristine lakes, challenging mountains, green forests, indigenous wildlife, life-cycle festivals and the joys that travel and discovery can bestow upon us.